Virginia Class Attack Submarine: Named Idaho (SSN-799) on 22 August 2015. Idaho will be delivered by GDEB located in Groton, Connecticut. Specifications:Power Plant: One S9G pressurized water reactor, 29.84MW (40,000hp), one shaft with pumpjet propulsor, Improved Performance Machinery Program Phase III one secondary propulsion submerged motor. Displacement, 7,800 tons submerged. Length: 377 feet. Draft: 32 feet. Beam: 34 feet. Speed: 25+ knots submerged. Depth: Greater than 800 feet. 12 VLS & four torpedo tubes, capable of launching Mark 48 torpedoes, UGM-109 Tactical Tomahawks, Harpoon (missile)s and the new advanced mobile mine when it becomes available: Unmanned Undersea Vehicles, Special Warfare: Dry Deck Shelter. Advanced SEAL Delivery System. Sonars: Spherical active/passive arrays. Light Weight Wide Aperture Arrays. TB-16, TB-29, and future towed arrays. High-frequency chin and sail arrays. Countermeasures: 1 internal launcher (reloadable 2-barrel) 14 external launchers. Crew: 134 officers and men. 2.06k First, there was Sputnik. Now there is Spudnik! 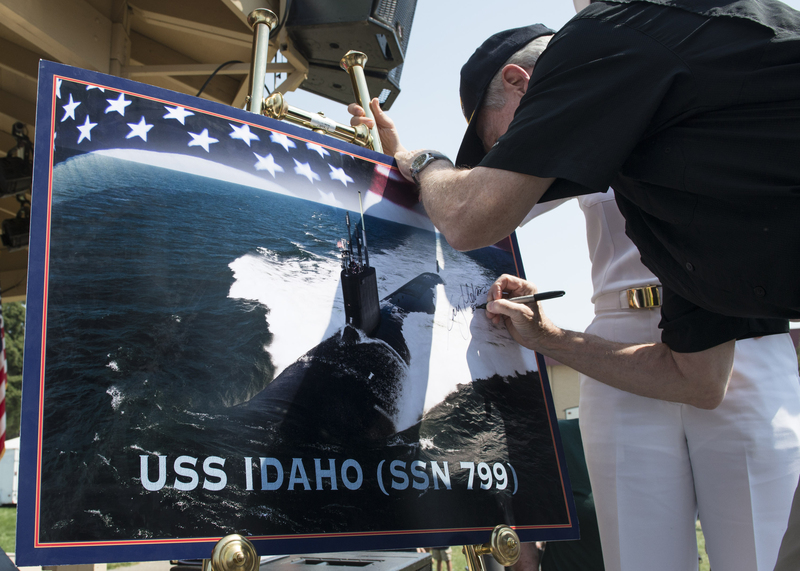 Secretary of the Navy (SECNAV) Ray Mabus announced the name of the Virginia-class attack submarine SSN-799 as Idaho, at the Western Idaho Fair on 22 August 2015. Insert photo courtesy of wikimedia.org. U.S. Navy photo # 150822-N-LV331-002 by Mass Communication Specialist 2nd Class Armando Gonzales, courtesy of navy.mil. via Ron Reeves (of blessed memory). There is no DANFS History currently available for Idaho (SSN-799) at the Haze Gray & Underway Web Site, the main archive for the DANFS Online Project.